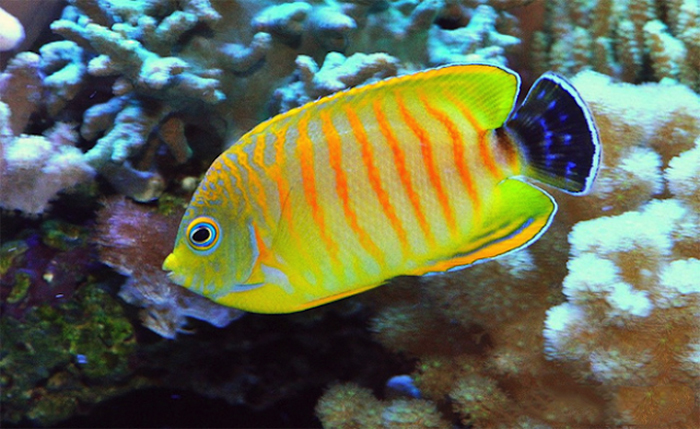 By Lemon TYK Whether you’re a reef enthusiast, aquarium owner or someone who refuses to conform to arbitrary titles, it is safe to say that you have, at some point in time, taken a photo of a fish or coral that you’ve found interesting. 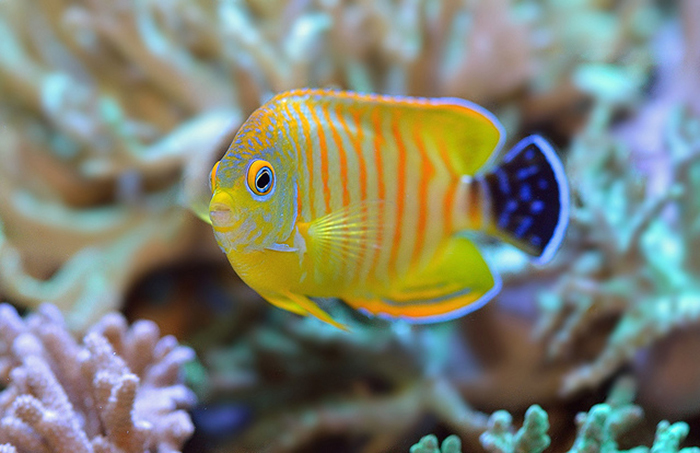 It’s safe to say that in this day and age, the evolution and appreciation of the reef-keeping hobby has grown in tandem (sometimes almost as if in an arm’s race) with photography. Photography is becoming increasingly popular, not only to digitalize day-to-day activities, but also to capture precious moments in one’s life. It is important to note that while this article aims to elucidate some fundamental aspects of photography through the use of an SLR camera, photography is itself an art, and as with all derivatives of this field, there is no wrong or right, and what works for me may not necessarily work for you. There is ultimately nothing more important than having fun, and as long as you are happy with your work, then that in itself is enough to transcend all technological limitations you may have. And yes, the old saying goes – a carpenter is not judged by his tools, but by his skills (or something along those lines)! 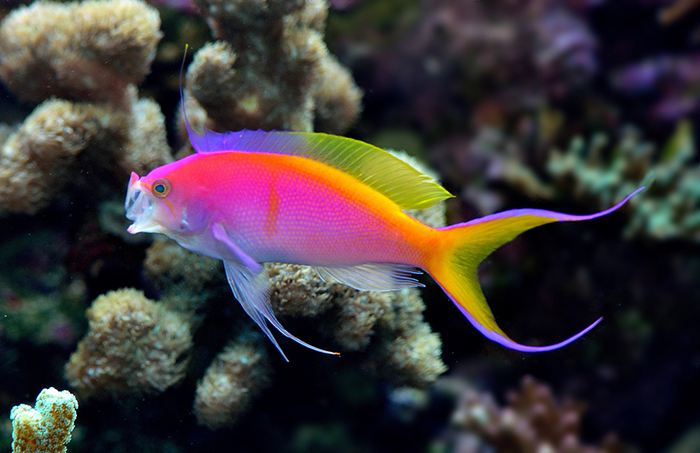 Pseudanthias bartlettorum in a picture perfect pose. Photo by Lemon TYK. Again, with the advancements in imaging equipment, you may one day find yourself in the presence of a high-end SLR camera. Perhaps you’ve gotten one for Christmas, or your family member has one that you’ve been wanting to try out. This article shouldn’t be seen so much as an instruction manual, but rather as a rudimentary guide to understanding the fundamentals of photography. 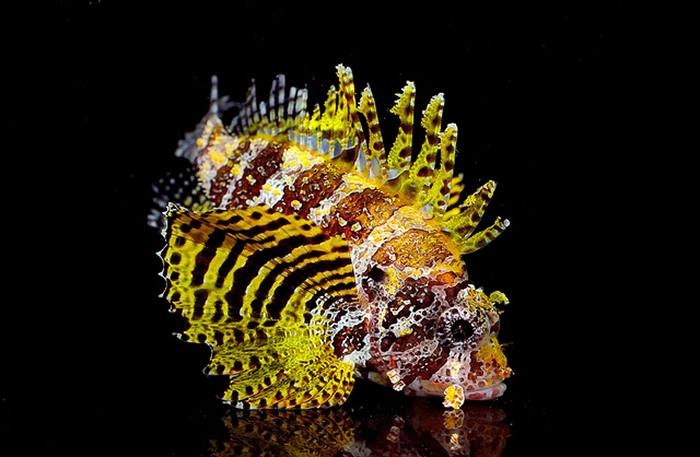 This, of course, transcends far beyond the photographic applications for your reef tank, and throughout this post you’ll see various photographs encompassing a wide genre of subjects. 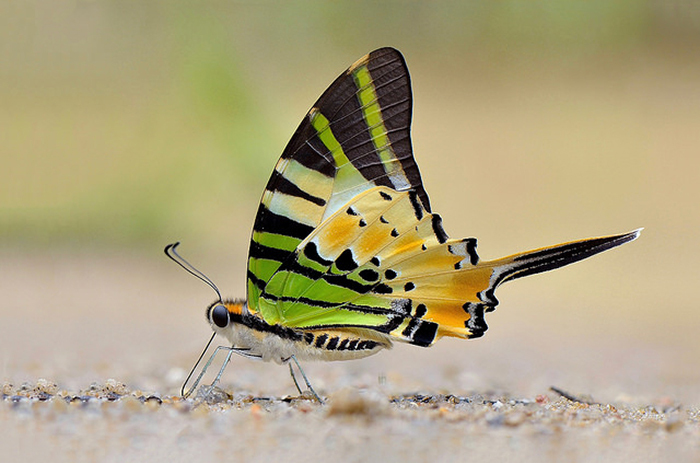 I’m primarily focused on butterfly and fish photography, so various photos from these two fields will be employed heavily throughout this article to highlight various points of topic. 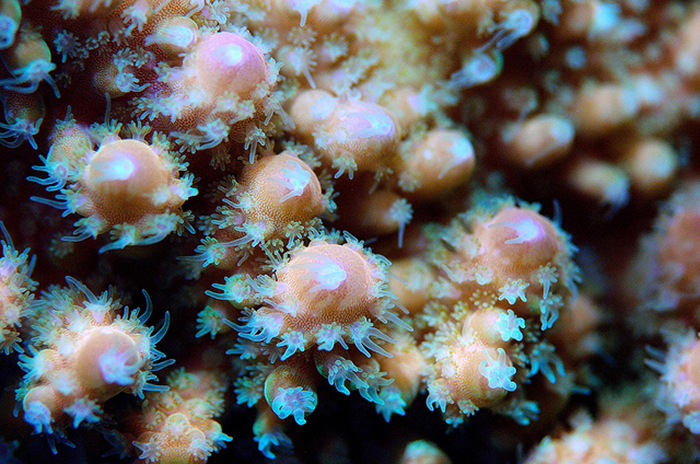 A close up shot of Acropora gemmifera using a dedicated 105mm macro lens. Photo by Lemon TYK. Before we begin, it should be mentioned that I do not consider myself an expert in the craft of photography. To me, it is a hobby comprising roughly 50% experimentation and 50% actual camera know-how. There are literally hundreds of thousands of photography wizards out there, and if you’re reading this, please feel free to correct me or add on certain details that I might have missed. 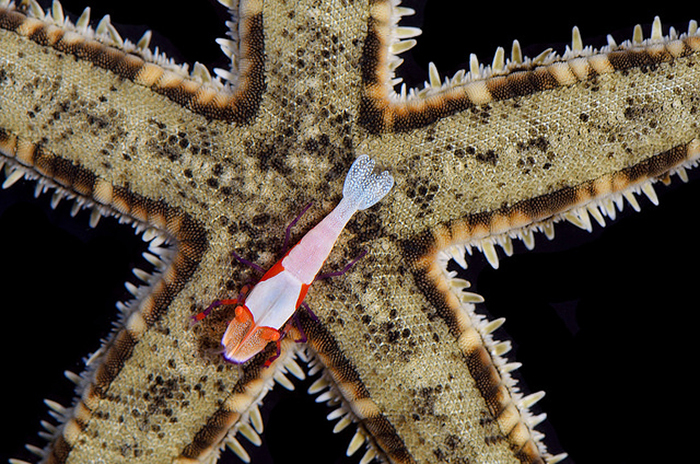 Macro photography is a great way to capture minute details in small subjects, such as this emperor shrimp on a starfish. Photo by Lemon TYK. As you may already know, a SLR camera is a versatile tool with a myriad of different functions and lenses, each serving different purposes. This may seem overwhelming and overly complicated at first, but taking the time to play around and figure out what each of the buttons do will greatly help in your transition from an amateur to a professional in no time. The majority of examples used in this article will focus on the use of a macro lens, specifically the Nikon 105mm. 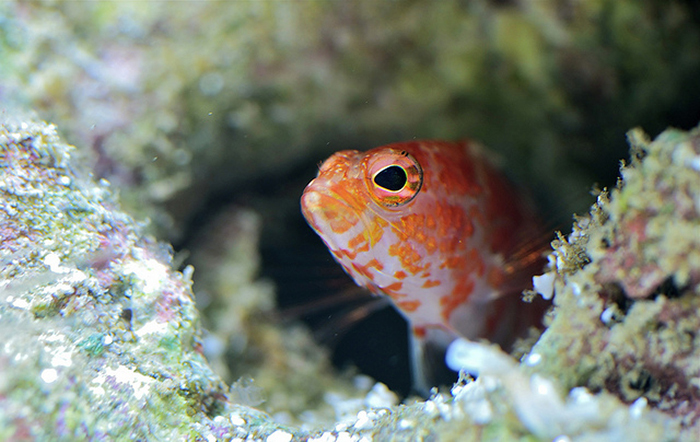 Macro lenses are great for close up or macro imaging, and in the context of our reef aquarium and its inhabitants, that is what we want (mostly). In addition, macro lenses allow you to place greater emphasis on the subjects in focus, rather than the background. You’ll get a better understanding of this as we move along this article. A low ISO will yield a darker image, which can be compensated with the use of a camera flash. In this scenario, a dimmer background with the subject lit up (Genicanthus semifasciatus) will create a contrasting effect. Photo by Lemon TYK. Equipment and lenses aside, there are three main pillars of photography that photographers should familiarize themselves with. Also known as the photography triad, they are ISO, aperture and shutter speed. The photos you see peppered throughout this article were all shot in manual mode, with direct manipulation of these three components. One fundamental aspect of the photography triad is that they all directly affect each other with regards to one critical aspect – lighting. In addition, this article will briefly touch upon on the role of camera flash, as well as some nifty tips on photographing your subjects in a “studio” setting. But, before we get there, let’s explore what each of these pillars actually does. ISO ISO is the first (and perhaps the most important) pillar of the photography triad. To put it in very simple terms, ISO is the level of sensitivity of your camera to available light. The lower the ISO, the less sensitive it is to light. Conversely, the higher the ISO settings, the more sensitive your camera becomes to light. At a high ISO setting, the camera’s sensor increases its sensitivity and produces a brighter image, allowing photos to be taken in dim environments. This, however, comes at a cost. Higher ISO settings often lead to grainy (or noisy) photos. While this can be cleaned up in post processing, it is generally best to stick with a lower ISO, and then manipulate the lighting with other components. This is a major selling point for some of the newer, high-end SLRs, which boasts of incredibly high ISO capabilities, allowing you to operate in very low light conditions while still producing bright images with negligible artifacts. Needless to say, this comes at a price, and for struggling students like me, that is not a economically friendly option to escape grainy photos. A hybrid Centropyge flavissima x C. eibli shot in ISO 200, yielding a bright, crisp and clean image. Note the out-of-focused backdrop, which is an artifact of shooting at f/4. More on f-stop later. Photo by Lemon TYK. Lower ISO settings are therefore always preferred, and in instances where ambient lighting is very strong (for example in bright sunshine), ISO settings can even be set to base levels. Every camera has a base ISO, which is the lowest ISO setting on your camera capable of producing the best image quality without any noise or grain compromise. For the model I am using, the base ISO is 100, but it differs from camera to camera. However, it is not always possible to operate your equipment at base ISO. Remember, a low ISO makes the camera less sensitive to light, and therefore dims the image. This would be counterproductive in conditions of low light. So how do we go about resolving this? The same fish shot at ISO 2000. Notice the noisy and grainy background. This was also shot at f/16. Notice how the background is not thrown out of focus as in the previous photo. Photo by Lemon TYK. ISO numbers typically start at 100/200, increasing in powers of twos subsequently. Generally, it goes as follows. 100, 200, 400, 800, 1600, 3200, 6400 and so on and so forth. You’ll notice that very powerful cameras with better image sensors will offer ISO levels in the tens of thousands. What is important to know is that each increment doubles the sensitivity of your camera to light. Therefore, ISO 400 is twice as sensitive as ISO 200, and four times as sensitive to ISO 100. This can be visualized in terms of speed. ISISO 3200 – 1/32 second This means that a higher ISO will enable you to capture faster moving objects. But remember, a high ISO also means brighter images and more noise. It’s all about finding the balance. And if you find yourself stuck, don’t forget that there are two other pillars that directly influence light. One of which is aperture. This macro shot of Melanocyma faunula excellently displays a macro lens’ ability to throw the background completely out of focus with a low f-stop. In this case, f/4 reduced the background shrubbery into a creamy green backdrop. Photo by Lemon TYK. Aperture Aperture is the second pillar of he photography triangle, and is one of utmost importance when it comes to macro photography. Depending on its setting, aperture allows you to keep the subject and its background in focus, or throw everything but the subject out of focus to create a creamy backdrop. In other words, aperture defines the bokeh and point of focus in your photos. Bear in mind that this is in application to the usage of a dedicated macro lens. The aperture is a hole in your camera lens which allows light to pass though to the camera body. It can be comparable to the pupils of your eyes, dilating or constricting to control the amount of light that enters the lumen. When the pupils dilate, more light is allowed to enter. This is essentially the same for a camera’s aperture setting. A smaller aperture will allow lesser amount of light to enter, while a wider aperture will allow more light to enter. In photography, aperture is measured in f-numbers, otherwise known as f-stops. A smaller f-stop will give a wider aperture, and a larger f-stop will give a smaller aperture. This is a little confusing since it’s an inverse use of language, but this pictorial will hopefully provide better visualization. F-stops and their aperture sizes. The smaller the f-stop, the larger the opening, and thus more light enters. Photo by Wikipedia. As previously mentioned, aperture is often directly related to depth of field. This is especially so in macro photography. Depth of field is defined as the area of an image which appears sharp, or in focus. A large f-stop (which means a smaller aperture) will bring more of the background and foreground in focus, as compared to a small f-stop (which means a bigger aperture). The latter will keep the subject in focus while throwing the background into a blur. This GIF helps to illustrate this point perfectly. Notice how the cactus in the background becomes increasingly in focus as the f-stop increases. Also notice that the photos are becoming increasingly darker as well. Remember, a smaller aperture will let less amount of light in. Again, finding the balance is key. The lens and your subject also contribute significantly to depths of field. 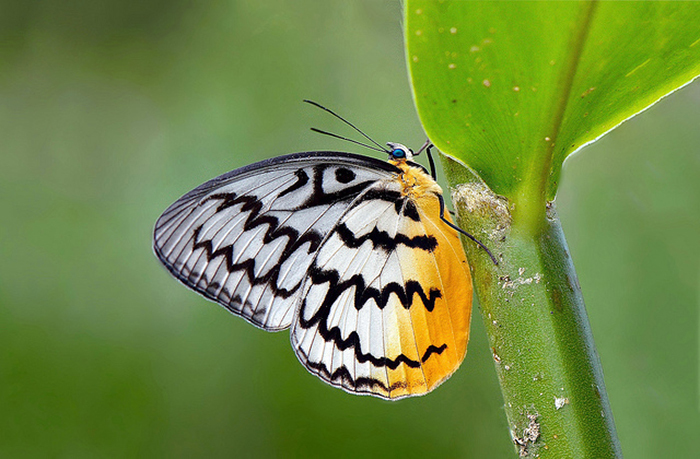 With a macro lens especially, if the subject you intend to photograph were big, you would have to increase your focal length to accommodate everything in the frame. A longer focal length increases the depth of field, and even with the largest aperture setting, the background may still be in focus. This is a limitation with short focal-length macro lenses. Physically increasing the focal length also means that you are putting greater distance between your lens and the subject, and if the subject is substantially large, this means that you would have to back up pretty far! Try taking a photo of a building with a 105mm macro lens for example. You’ll see what I mean! A 105mm macro lens really shines when it comes to subjects that are small, such as this Pathysa antiphates. Because I am able to go right up to it and minimize the focal length, an aperture of f/4 renders the background completely out of focused, complimenting the subject in frame. Photo by Lemon TYK. 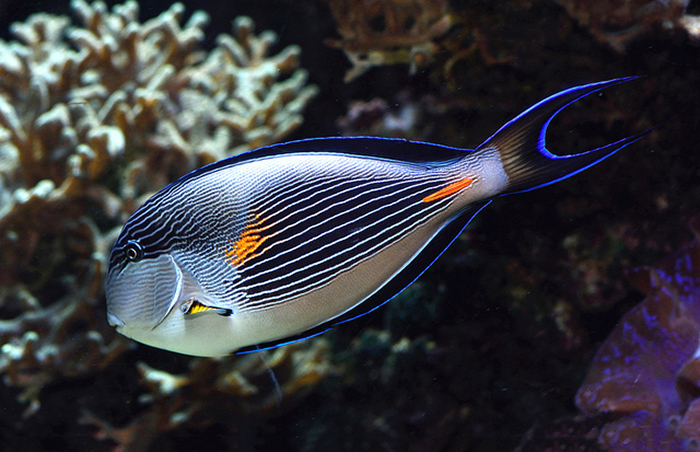 Conversely, because of Acanthurus sohal’s large size, and the increased focal length I need to produce while shooting it with a 105mm lens, a blurred background like in the photo above is simply not possible, even at f/4. Photo by Lemon TYK. In this case, the type of lens becomes an important factor in picture composition. Should you want to photograph a bird up in a tree, a 105mm macro lens will not work, as the subject is simply too far. A 600mm macro lens, however, will do wonders. Conversely, using a 600mm macro lens to photograph a small flower in front of you will not work. That is where the 105 come in. Shutter Speed Shutter speed is the last component of the photography triad. While aperture sets the stage for photos with dramatic depths of field, shutter speed controls the movement aspect of photography. A camera shutter is like a curtain, remaining closed until the camera is fired. When it does, it opens and exposes the sensor to light, allowing it to pass through the lens aperture before shutting again. 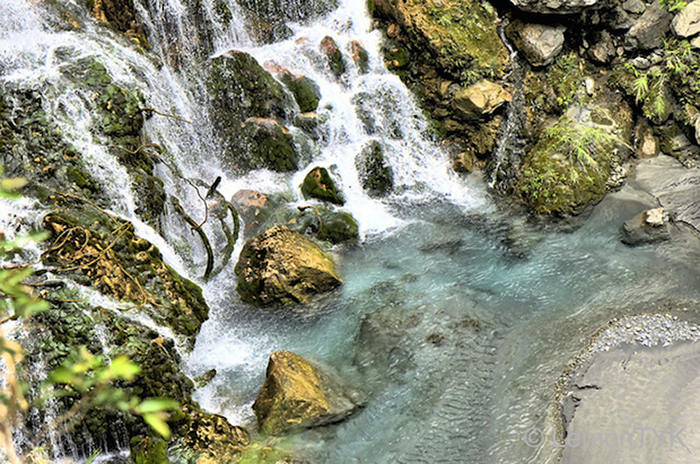 A slow shutter speed of 5 seconds results in the motion blur seen here in this waterfall. Photo by Lemon TYK. How long between this opening and closing of the shutter is defined as shutter speed, or exposure time. At a higher shutter speed, the camera is capable of freezing moving objects. At a low shutter speeds, the camera creates motion blur. This can be manipulated to your advantage by manipulating the shutter speed. Like ISO, shutter speed is measured in fractions of a second. For example, ¼ means a quarter of a second, while 1/200 means two hundredth of a second. Conversely, shutter exposure can also be measured on the other spectrum, in whole seconds. This is useful for creating motion blur, and shutter speeds up to 30 seconds can often be used, but not without the use of a tripod. Conversely, a shutter speed of 1/200 manages to freeze part of this waterfall, showing individual droplets. Photo by Lemon TYK. In movement photography, the manipulation of shutter speed is extremely important. Compare the two photos above, both depicting moving water. In the first photo, a slow shutter exposure of 5 seconds is employed, creating soft motion blur in moving objects. 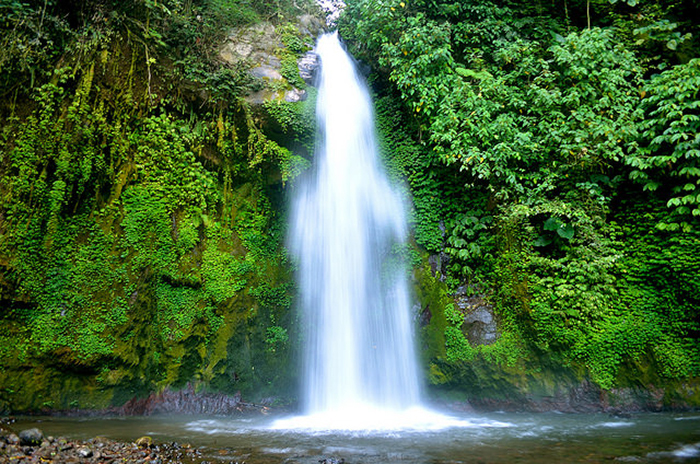 In this case, the waterfall appears soft, while everything that is not moving remains in focus. In the second picture, a faster shutter exposure of 1/200 is used. This freezes the moving water, and creates the effect of individual droplets suspended in midair. High shutter speeds are often employed in photographing fast moving subjects, such as a bird in flight, or a swimming fight. 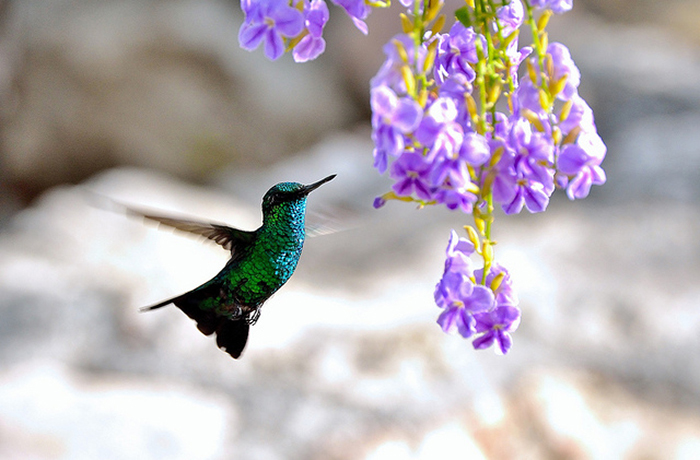 Humming bird photographers may find themselves cranking up the shutter speeds to 1/700 or even 1/1000 of a second! Conversely, a low shutter speed, especially if more than a few seconds will require the usage of a tripod to prevent your own trembling hands from creating motion blur. A nuptial Cirrhilabrus in display. Here, a shutter speed of 1/250 was sufficient to freeze the moving fish. Photo by Lemon TYK. 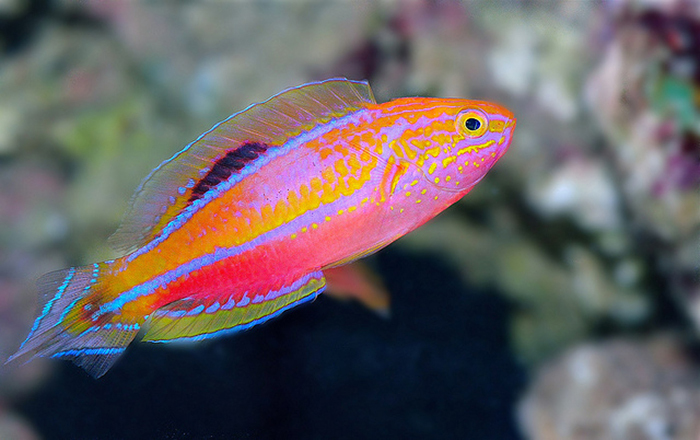 In the aquarium, a Cirrhilabrus in full display is perhaps one of the most beautiful, yet challenging subjects to photograph. 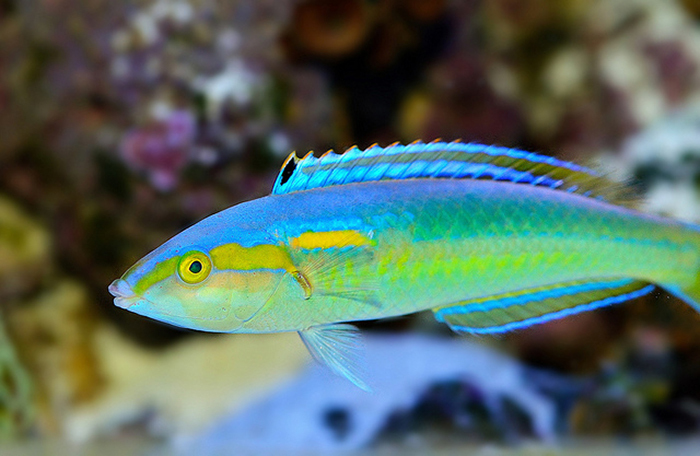 Males flash beautiful colors and patterns, but swim at tremendous speeds. A high shutter speed to freeze the subject is important, but tracking it through the camera’s viewfinder adds to the challenge as well! The photo above was taken with a shutter speed of 1/250, and was sufficient to freeze the subject fully without causing motion blur. This was combined with an aperture of f/4 to throw the backdrop into a smooth blur, so as to keep the subject in focus without any background distractions. ISO 500 was used, which isn’t too high as aquarium lights were sufficient in providing ambient lighting. An externally mounted camera flash was also mounted to provide additional lighting to the subject. 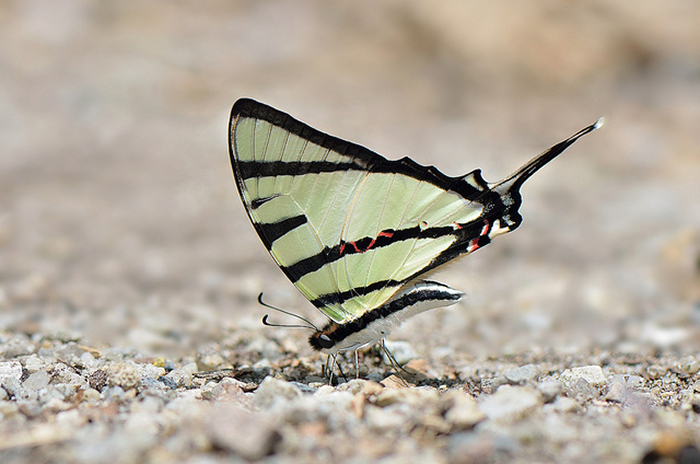 A shutter speed of 1/500 was enough to capture this butterfly in mid-flight! Photo by Lemon TYK. Unfortunately, 1/500 was not enough to freeze the wing beats of this hummingbird in flight. Photo by Lemon TYK. Now we see how everything comes together. Remember that ISO, aperture and shutter speed are all inherently linked. Each of them directly influences light. Controlling each individual aspect with careful consideration of their secondary functions will ensure you get a properly exposed photo, while also allowing you to keep everything else you want in check. For example, if you want a photo with a smooth and out of focused backdrop, open up your aperture, and keep the f-stop low. This, however, will mean that you would have to adjust the ISO and shutter speed in such a way as to prevent over-exposure of light! Flash can be useful when illuminating subjects that are hiding in dark places, such as this Plectranthias inermis in his cave. Photo by Lemon TYK. Flash The usage of camera flash is a very important source of additional, focused lighting. Most cameras come with an in-built flash, but for more control and manipulation of this additional light source, a mounted, external flash can be used. Flash is a powerful lighting tool, and when used properly, can make or break a photo. It allows greater flexibility by adding a fourth lighting aspect on top of the basic trio. The iridescence seen in this Pseudojuloides xanthomos was a result of camera flash. Photo by Lemon TYK. This Paralaxita telesia is usually inconspicuous in the deep jungle shade. Only with camera flash can the iridescent blues and red be appreciated. Note the dim conditions resulted in the use of a high ISO, which resulted in a slightly noisy background. Photo by Lemon TYK. Flash can also add a new dimension to your photos, in particular, to bring out certain colors. 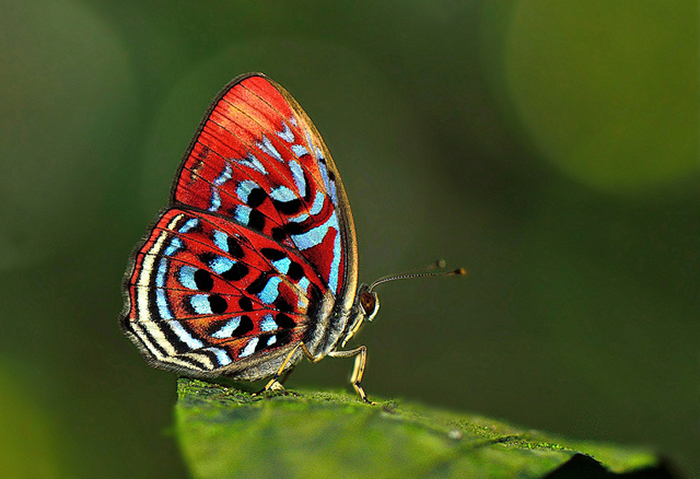 Many fish, butterflies, birds and insects possess structural coloration that can only be seen at certain angles or light conditions. Iridescence on scales and features, for example. 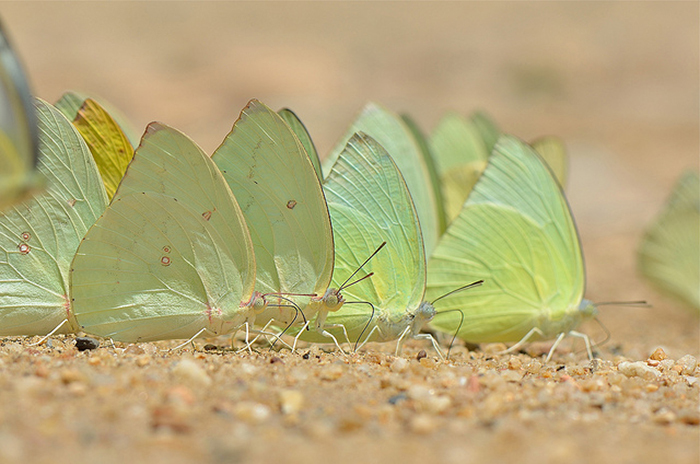 Notice how the butterflies in the foreground are cast in their own shadow from being in a backlit situation. Using a stronger camera flash can help to overcome this. Photo by Lemon TYK. Camera flash can also be employed to overcome challenging light conditions, especially when out in the field. Subjects exposed to light from behind will naturally be shaded by their own shadow in front. For example, a person standing in front of a sunset would appear dark. This phenomenon is called back light, and in certain scenarios, intentional backlit photography can be applied for a dramatic and contrasting effect to show the play on light. This shot of Dercas gobrias was illuminated with flash from the front to counter the harsh back lighting. However, the flash was left intentionally slightly underpowered. 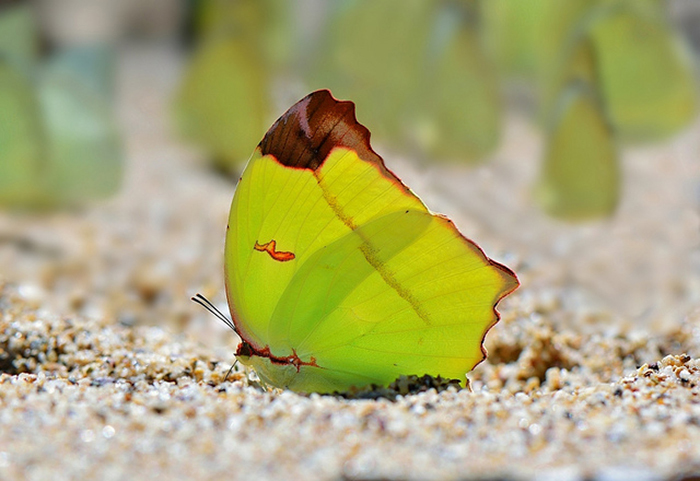 In this case, it created a very nice effect highlighting the translucency of the subject’s wings. Photo by Lemon TYK. In macro photography, backlit scenarios occur very frequently as well. An example would be trying to photograph something small like an insect or a flower with direct sunshine coming from behind. The resulting shadow would either cause the subject to appear dark if it is opaque, or hyaline if the subject is translucent. If this is not what you want, then deployment of your camera flash can be used to overcome a backlit situation. A camera’s flash casts diffused lighting in a forward direction with respect to the subject. This brightens up the shadow caused by the backlight coming from the opposite direction. 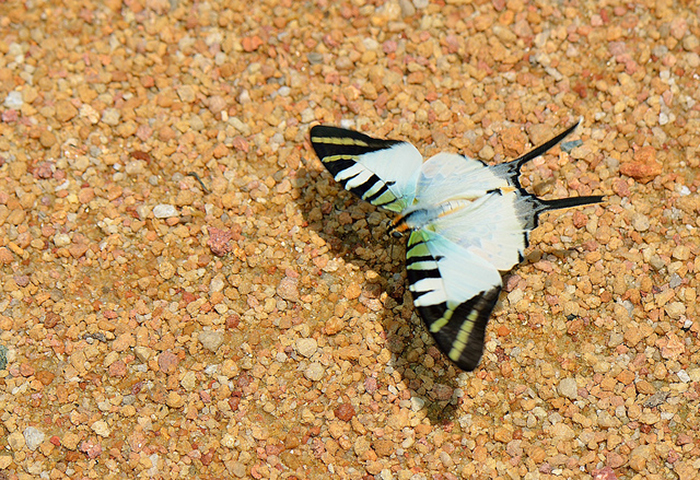 Another photo using backlight to intentionally highlight the subject’s wing translucency. Photo by Lemon TYK. 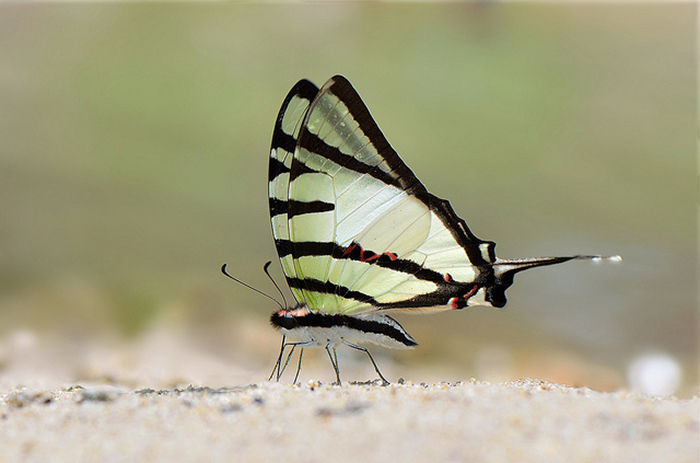 The same butterfly, this time shot with a higher-powered flash to counter all backlight. Notice how the wings are no longer translucent, because the amount of light illuminating from the front is now more than that coming from behind. Photo by Lemon TYK. 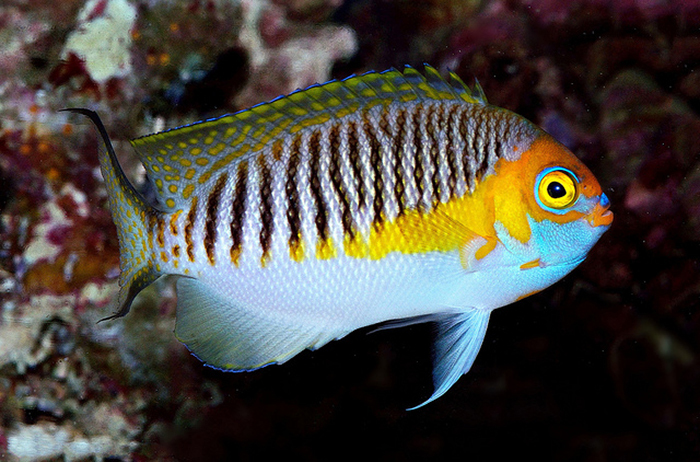 A yellow Dendrochirus brachypterus photographed in a “studio” style setting. Photo by Lemon TYK. While many of my photos are of animals in their natural surroundings, sometimes I find myself needing to photograph fish in certain artificial, “studio” type styles. 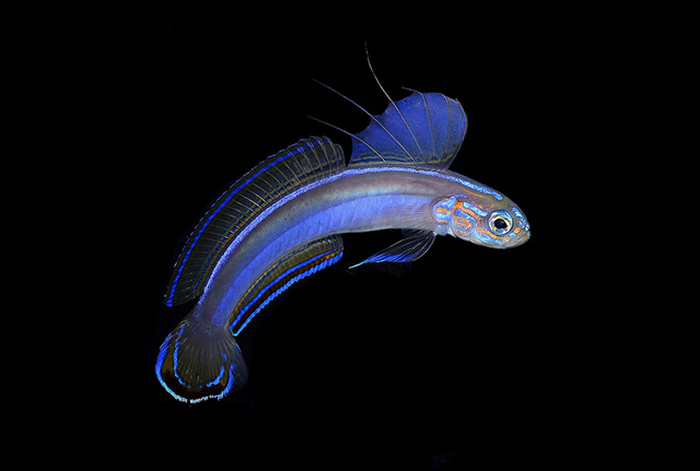 These often include photographing a subject against a completely dark backdrop, with fins extended and in full display. 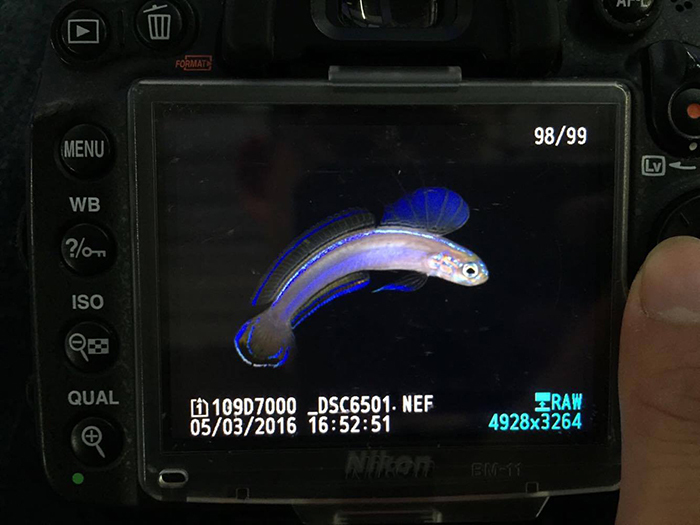 Such photos are great for scientific publications, or if you simply want to highlight certain key aspects of a fish without the need for an aesthetically pleasing backdrop. To do this, I often find it incredibly useful to carry out your photo taking in a small, portable tank. I have a nifty aquarium no longer than 18 inches that I keep dry and tucked away. The back panel is coated with a black sticker. A small LED or T5HO lamp placed overhead is sufficient for illumination. The small aquarium also makes it easier to photograph the fish, as it doesn’t have a lot of space for it to hide or swim away. An example showing Ptereleotris kallista in a small, portable photography tank with a black sticker pasted onto the back panel. Photo by Lemon TYK. Here’s what the shot looked like straight out of the camera’s LCD screen. Notice the blue accents on the fish not seen in person. 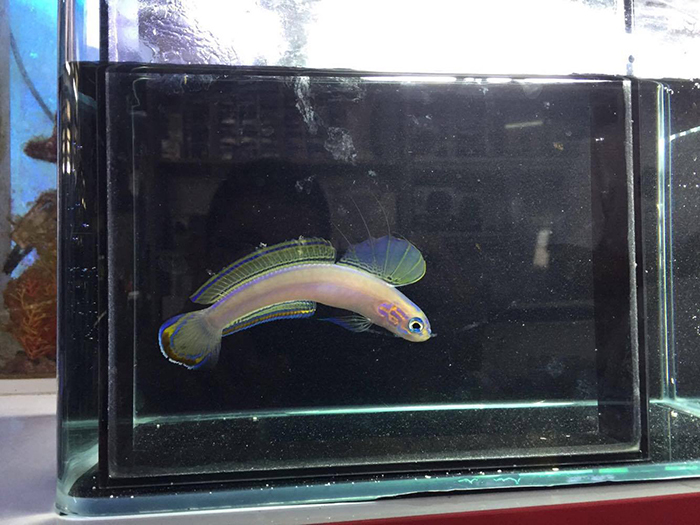 This is a result of camera flash accentuating the iridescence. Photo by Lemon TYK. The finished photo, cleaned up in photoshop with artifacts removed. Photo by Lemon TYK. Even with a black backdrop, it is often necessary to edit the file in photoshop to clean up any artifacts that might still be present. Artifacts such as reflection, bubbles, scratches from the glass etc. are rarely ever absent, and even so, post-processing is often needed to achieve a smooth, homogenous background such as the one above. Photos such as these are great if you want a stylistic approach, or if you intend to use the photo for a scientific plate or illustration. They aren’t difficult to produce, but often you’ll need someone to help manipulate the position of the fish by means of gentle coaxing, such as with a chopstick or an acrylic sheet. 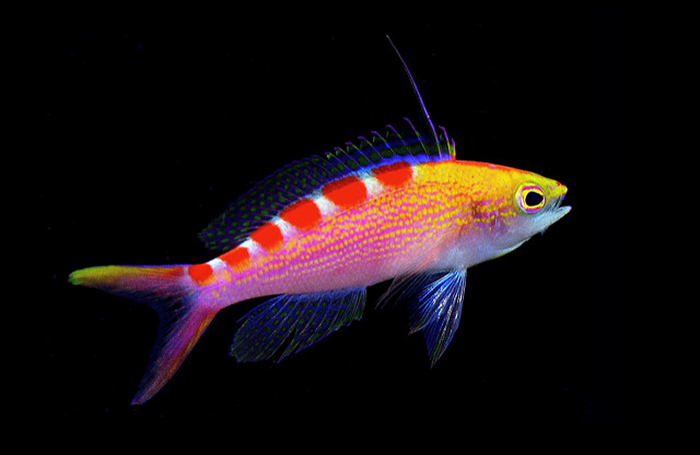 Pseudanthias flavoguttatus. Photo by Lemon TYK. It’s completely impossible to embody the basics of photography and what I want to say and explain in a short article, and likewise there are only so many photographic examples I can use to illustrate my points without turning this into a photostream. I hope that it at least gives you an idea of the basics, as well as an idea on how to manipulate the settings on your camera to achieve your desired effects. Remember, every camera is different, and photography is all about practice. The more you play around and get to know your equipment, the better you’ll be. More importantly, don’t forget to have fun! A carpenter is defined by his skill, not his tools! 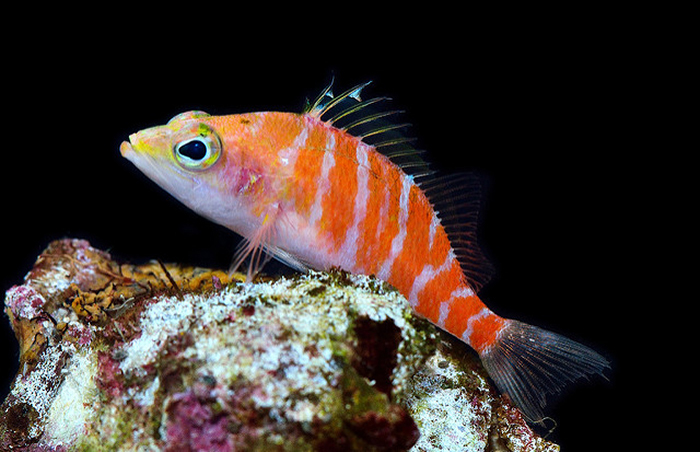 Plectranthias bennetti photographed on a single rock with a black backdrop. Photo by Lemon TYK.